My name is Donald MacDonald-Ross, and I have been doing genealogy for over three decades as a hobby, mostly researching my ancestors and relatives in Ireland and Scotland. My paternal grandfather, Ross MacDonald Ross, was born in 1891 to a farming family at Lower Arboll in Tarbat Parish, at the eastern end of the County of Ross and Cromarty. My second cousins still live on the family farm there, which has been occupied by our Ross family at least back to the late 1820s. 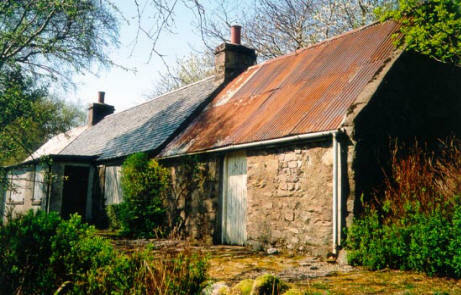 Grandfather's father, Andrew Ross, had married in 1870 at Arboll to Chirsty MacDonald, one of three sisters who came from Reiff in the Coigach District of Lochbroom Parish, at the far west of Ross and Cromarty. A well worn path from west to east, an aunt of the sisters had already settled near Arboll at Balintore in the neighbouring parish of Fearn. Chirsty's forename shows up in records as "Chirsty", "Christy", or "Christina". 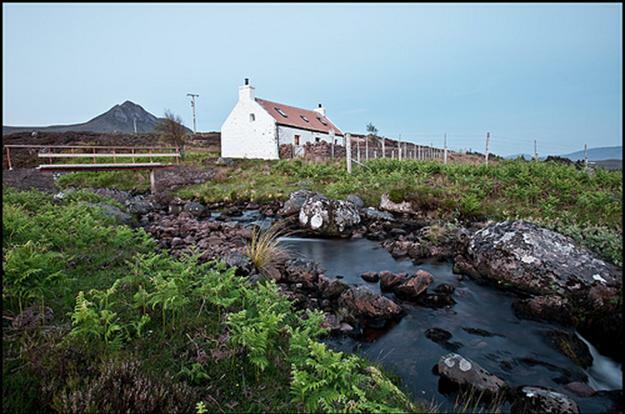 Cursty, sometimes spelled Ciorstaig is a common gaelic name especially on the west coast, and the family at Arboll maintained communication with the Reiff MacDonalds through the first decades of the 20th century. 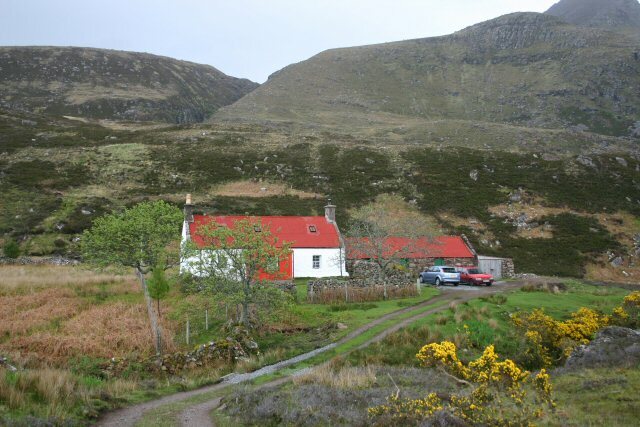 Grandfather spent summers with his cousins at Reiff as a child. 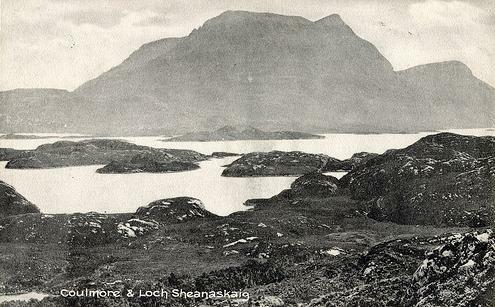 He later became a well known landscape artist in Ireland, but some of his earliest known paintings were of Coigach. 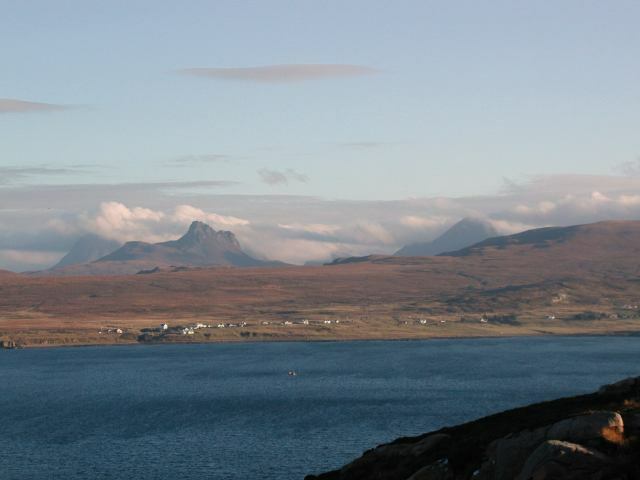 May of 1980 I got my first view of Coigach, staying several days at the Ullapool Youth Hostel, I had not yet found the living cousins at Reiff I later visited in 2006, but it was nice to see the area and get the first taste of the culture and history I have been trying to understand since. 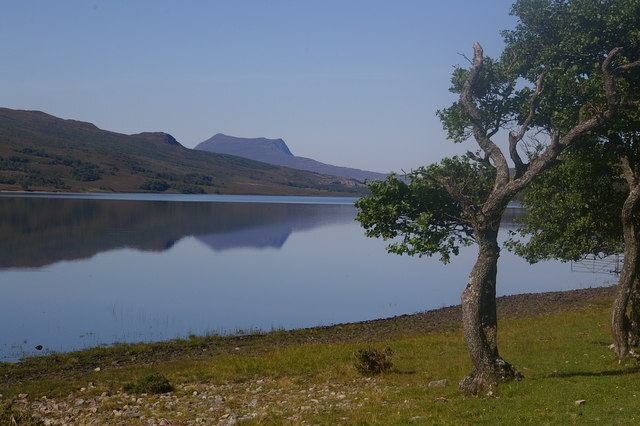 Though I continue to research my Irish and Easter Ross ancestors, I have found the genealogy of Coigach families to be especially challenging, and so have made that area the focus of this website. 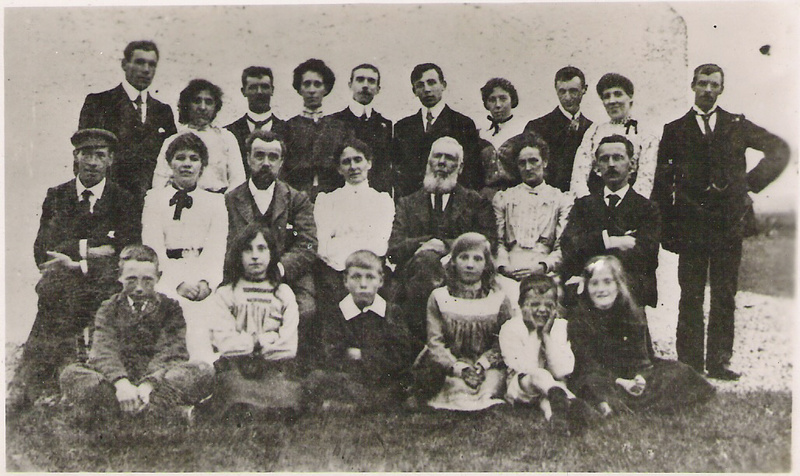 The files on this website include transcriptions of some of the data from 19th century censuses, I have followed each Household by notes on where the family members were in other census years, and hypertext links following the complex relationships between the families. editlog Though neglected for several years, gives an overview of development process of files on this website. Contacts and Sources: people, websites, books, & LDS film nos. 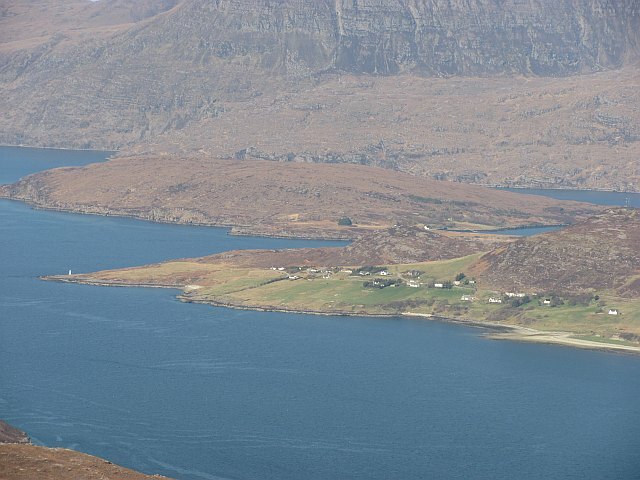 Coigach Community Heritage Group (external link), a great organisation, their website is in early development stage, they would love to hear from anyone with an interest in Coigach heritage. A file I scratched together. 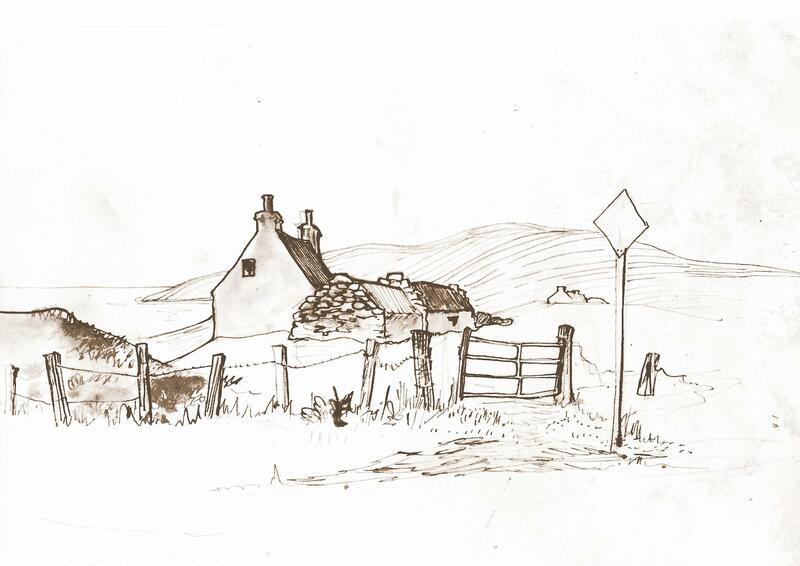 COIGACH: the "Mitford manuscript" is an article thought to have been written by Willy Muir around 1960, as well as great insights it includes lots of data from late 18th century documents! Notes based on various records from NAS; notes on photocopies of 18th century documents, mostly petitions to the Commissioners of Forfeited Estates. 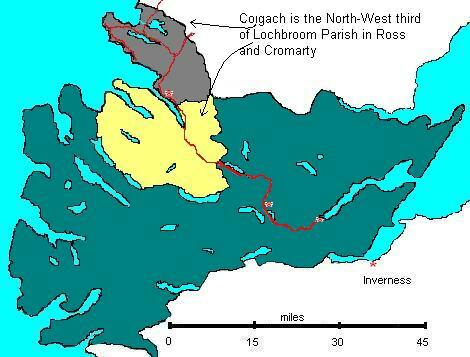 "The Barony of Coigach: Estate of Cromarty", an excerpt from the 1969 Doctoral thesis of Alan Gibson Macpherson, much noted historian, "A reconstruction of the human geography of some parts of the Scottish Highlands, 1747 - 1784"
A timeline of the Rebellion, focused on Coigach and Lochbroom people and places. A list of people involved, both sides and neutrals. 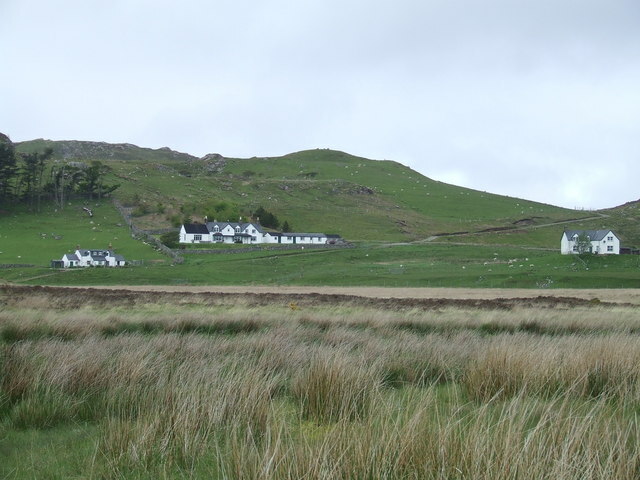 Testimony at the trials of several of the captured Lochbroom people. Letter from the Earl of Cromartie. 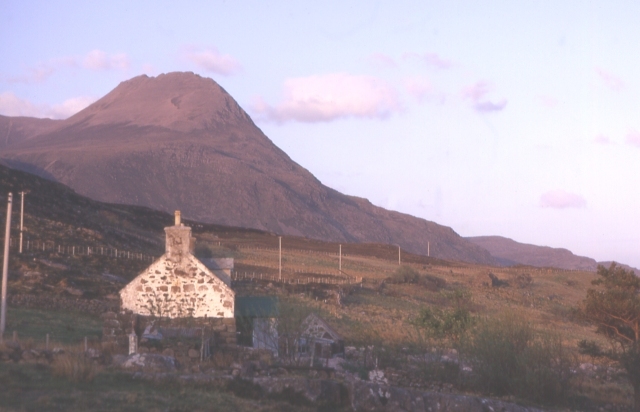 Exiled following the 1745 Rebellion the third Earl of Cromartie wrote to thank his tenants at Coigach for any money they could send to support his family. 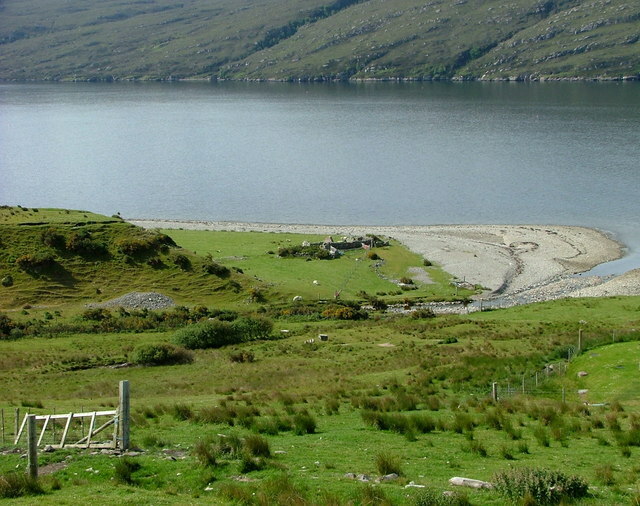 Coigach Gazetteer: Placenames and translations. Insurrection! 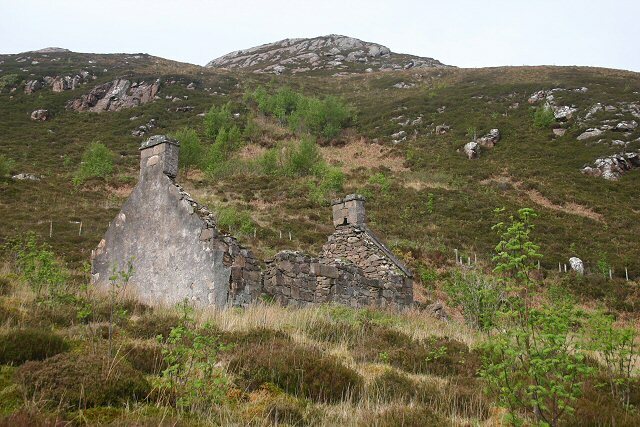 From 1851 to 1853 tenants at Coigach defied a relocation scheme, a part of Highland Clearance history, burning eviction notices, and "deforcing" authorities sent to evict or relocate them. Well documented in many books, these files look at some of the original sources. DISTURBANCE IN ROSS-SHIRE! An 1852 newspaper report on events in Coigach. 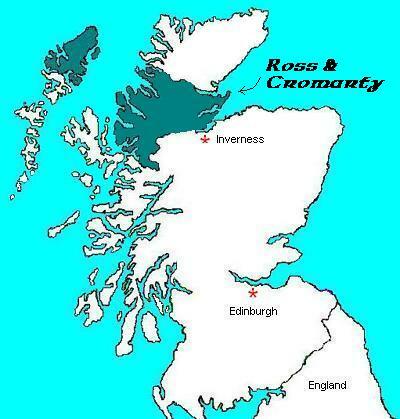 Disturbances in Ross-shire. An article, 4 April, 1853, in the "Glasgow Herald", on the trouble in Coigach. Deforcement in Coigach. This file is a letter to the editor from Andrew Scott, Factor for the Marchioness of Stafford, landlord of Coigach, stating his position, in part a reply to the previous articles. Resistance to Writs Another newspaper article on the events. "LOUIS NAPOLEON INVITED TO INVADE THE HIGHLANDS" A newspaper report, illustrating the fear held by the authorities. "WHO LOVED ME AND GIVETH SHELTER TO ME": Margaret Cameron's article on life of her gt-gt-grandmother, Susan Mackenzie, last Tacksman of Achnahaird, emigrant aboard the Sir Allan McNab. "A party of emigrants" This contemporary newspaper article tells of the departure of the Coigach families till their arrival at the emigration sheds of Birkenhead, Liverpool. Tragedy at sea. 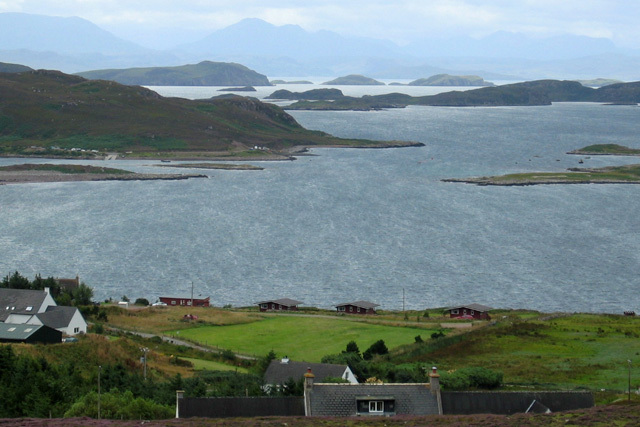 The people of Coigach made much of their living, and often met their deaths, in small boats on Lochbroom. 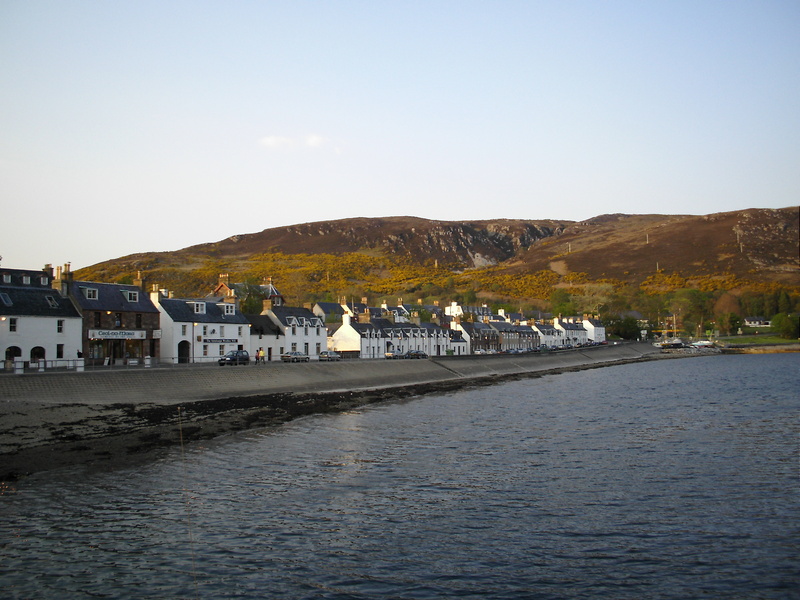 Strong drink suspected in the loss of a boatman from Jura at the quay of Ullapool in 1813. Child's play. 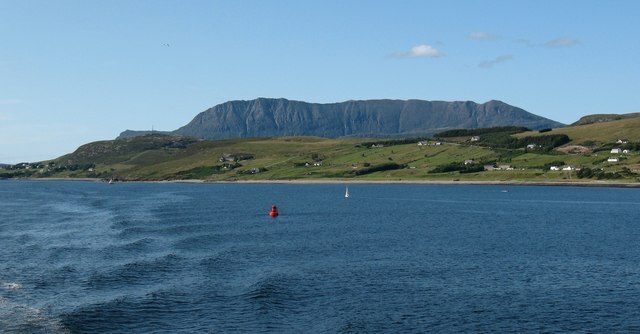 In 1816 a 14 year old boy falls from mast of the ship "Friendship" (see next file) sixty feet to the beach at Ullapool, and recovers! "Friendship of Ullapool lost". This newspaper report is of the 1822 death of Captain John Black of Ullapool, his crew of "seven men and a boy" near Thurso in a violent storm, along with loss of half of Ullapool's herring fleet. It also notes "miraculous" and heroic rescues. "Death of John Mackenzie" Newspaper report of the 1830 drowning of a son of the family of the tacksman of Achnahaird. "Melancholy occurance" An 1849 newspaper report of the loss of a boat at the Point of Riff. Five men rescued, a Widow drowned. "HEROIC CONDUCT" An 1858 report of the heroic actions of Captain Graham of the steamship Clansman leaping into the loch to save a lady. "A Boats Crew Drowned" An 1864 newspaper article about the death of six young people from Scoraig on Little Lochbroom at the Summer Isles of Coigach, gathering seaweed to manure their crops. "Three young men drowned" An 1871 newspaper report on a tragic event at Achnahaird. "Sad Case of Drowning" An 1874 magazine report on the death of two fishers from Letters off Isle Martin. 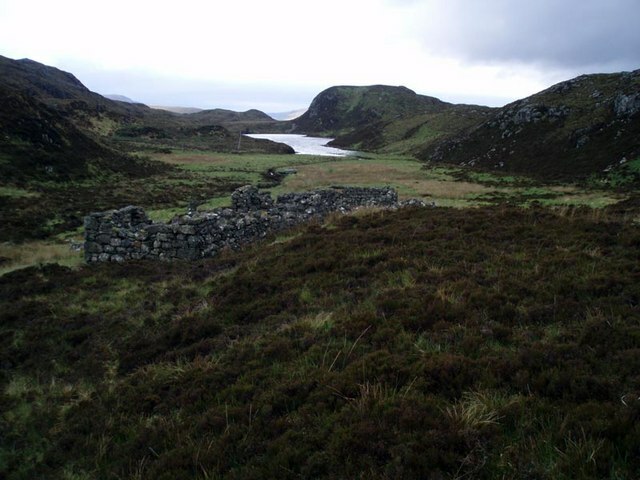 Two men die returning from Ullapool to Achiltibuie in 1877. 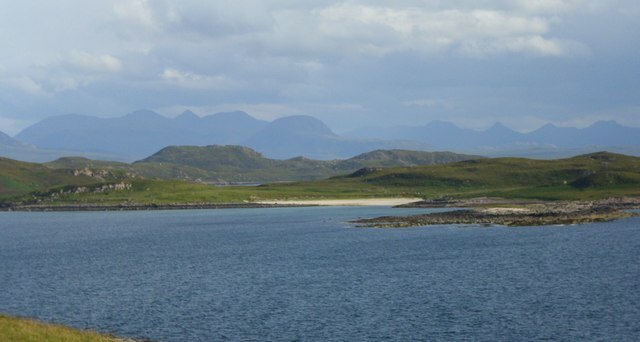 "PAINFUL BOAT ACCIDENT IN ROSS-SHIRE" In 1879 four men are lost at Coigach when returning from Ullapool. "FATAL BOAT ACCIDENT AT INVERNESS" In 1884 three men left Ullapool for Little Lochbroom in a small boat, wreckage found. Four fishers from Reiff die going to the fishing in 1887. "The monster was very tame, and the crew say that it did not seem to be afraid of them, and it had soft rolling eyes, and gazed at them for some time, occasionally turning towards some sea-maws that were flying above in the air!" "In Scotland, the boat is, in general, the property of the crew. On the day of going to sea every man carries on board his blanket, and such a stock of provisions as he thinks sufficient for the time he is to be out. The fish when hauled, are thrown promiscuously together in the boat, but on returning to port they are laid out in shares and divided by lot." 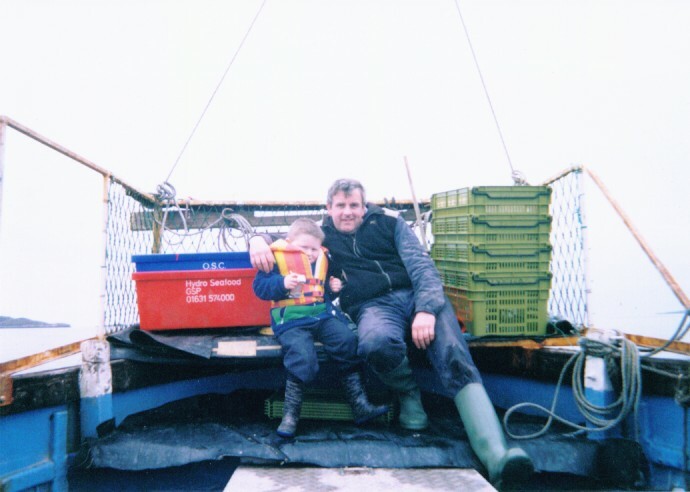 Cousin Duncan, Captain of his own boat, with his son. 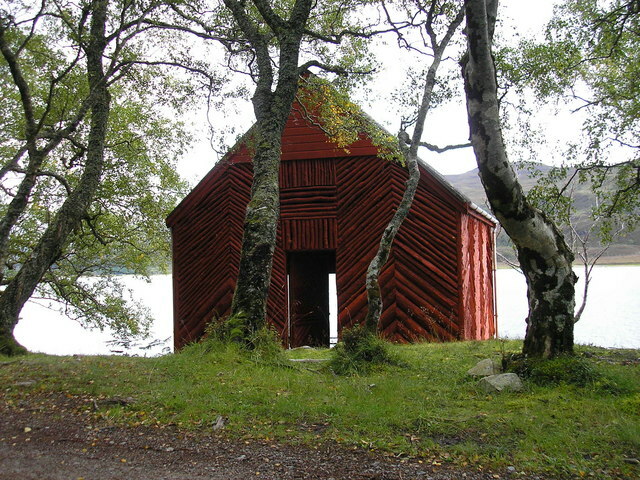 Modern continuation of the traditional Coigach economy. 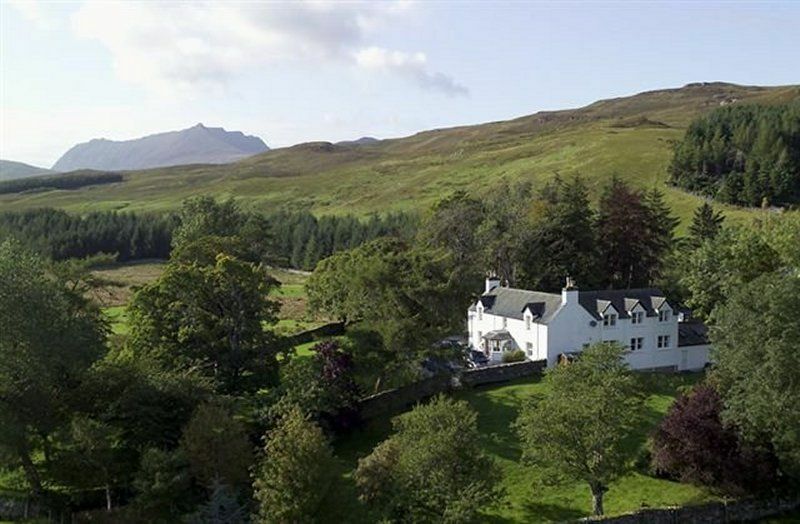 Managing shepherd, preferably from the South who does not speak Gaelic, wanted with 2 'common' shepherds, apply to John Nicolson, tenant, Tanera, Ullapool. Presumably the requirement to not be able to speak Gaelic was to prevent fraternisation and collusion with the locals, as the same day Nicolson published a warning that those found removing "shelly sand" from Tanera without paying him will be prosecuted. 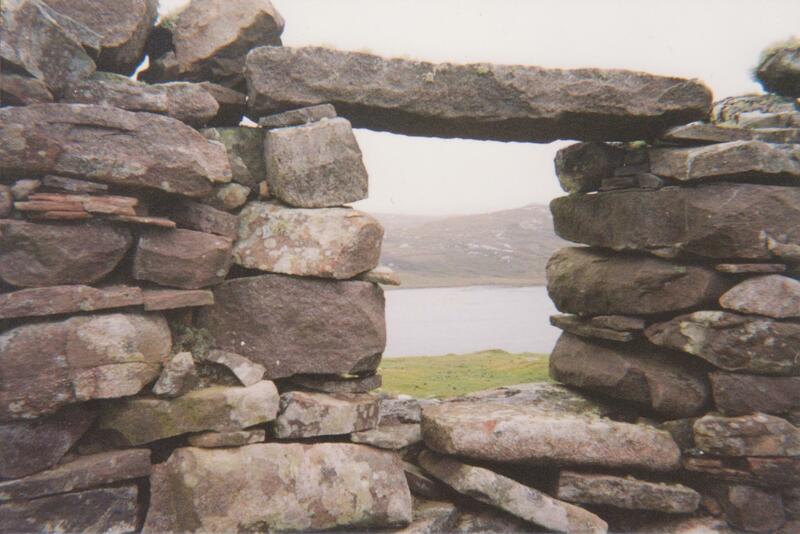 Faochag; a short study of a small hamlet! 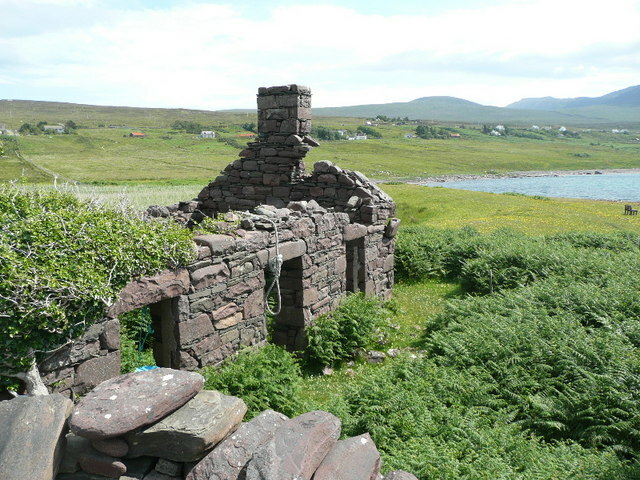 Tanera Island; An article written by Alexander MacLeod, one of the last inhabitants, he left in 1930, and died in 1974. Hugh's Letter; In 1918 Hugh McDonald wrote home to his father in New Zealand listing the relatives he met in Coigach. 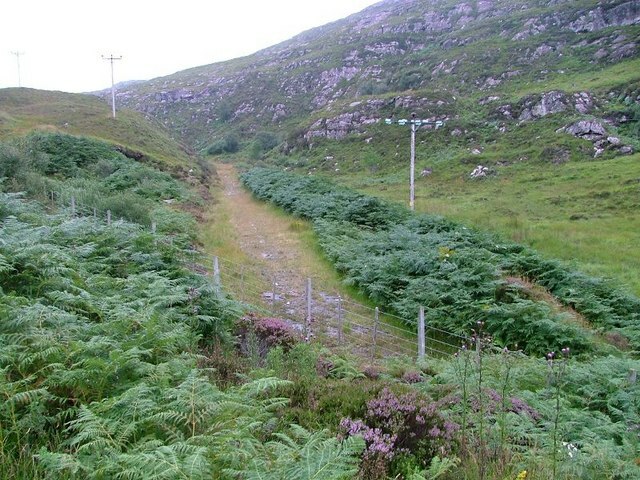 The Road to Reiff; In 2000 Marg Ward of New Zealand, a niece of Hugh McDonald, wrote an article regarding her own discovery of her ancestry in Coigach and visit there. 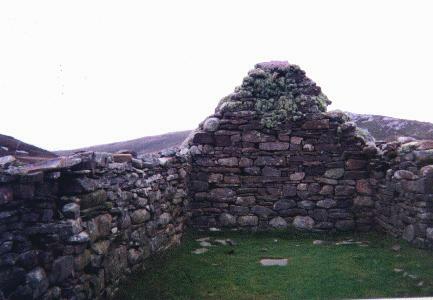 MacKenzies of Achnahaird. 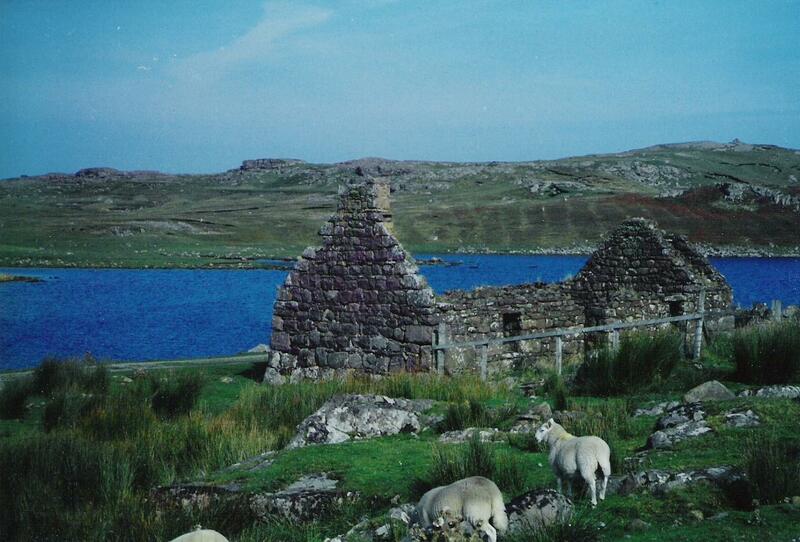 This family were Tacksmen (principal tenants) of Achnahaird, Reiff, and other parts of Coigach from before the Jacobite Rebellion till the Tenant revolt of the 1850s. The file gives some of their family history, and traces known descendants. 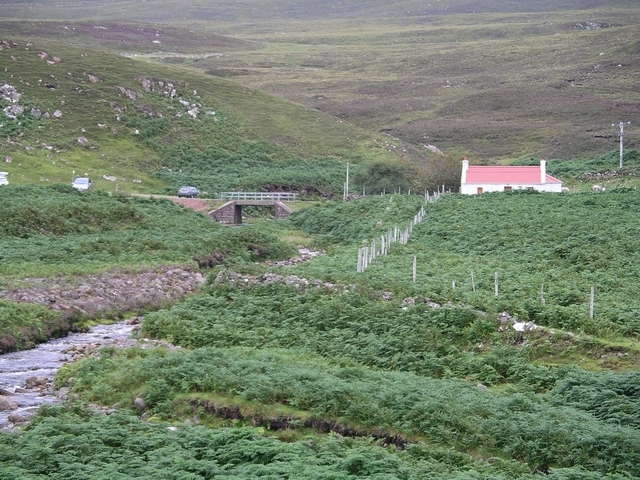 Mackenzie of Achiltibuie. 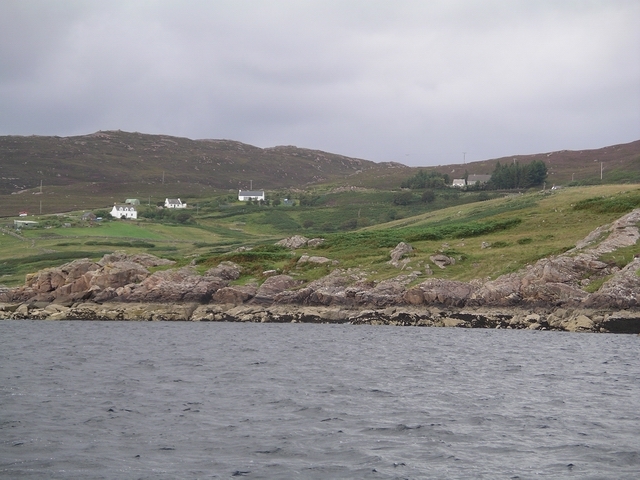 This family were Tacksmen (principal tenants) of Achiltibuie in the 18th century, with descendants prominant in the 19th as Tacksmen again during "the Coigach Insurrection". 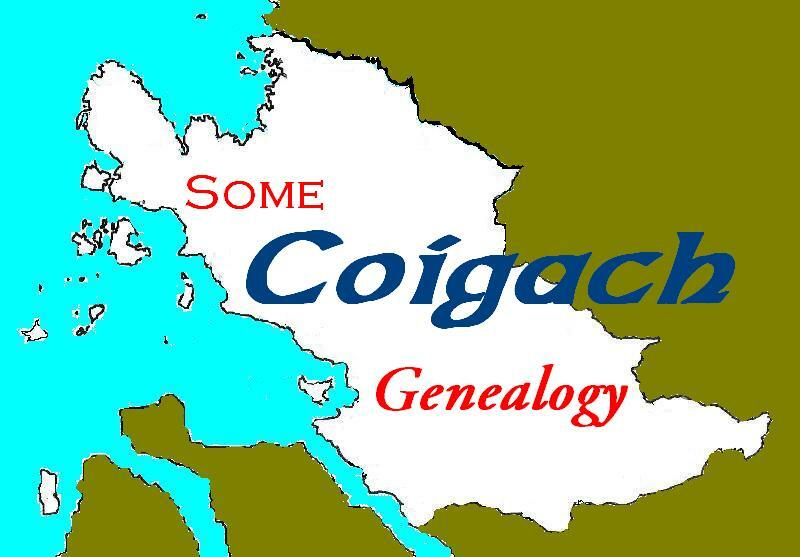 As far as I am aware, this file represents the largest documented descent of a Coigach family, descendants include people prominant in the histories of many nations. Mackenzie of Langwell. A locally important family not well or clearly examined in the 19th century Clan Mackenzie genealogies, this file is a new charting of their early generations. A Dangerous Lunatic! In 1856 Murdoch McKenzie, alias Campbell, alias Maciver of the Isle Ristol was committed to the Prison of Dingwall "as a Dangerous Lunatic". 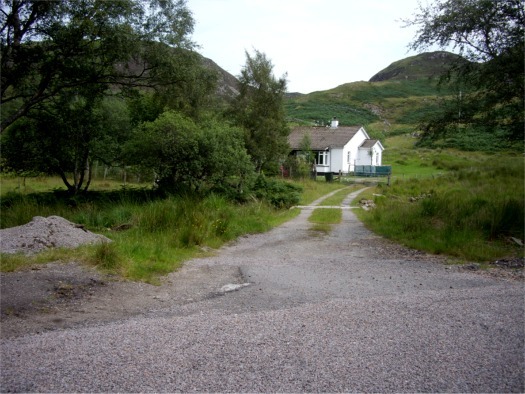 A Highland Witch Strange doings in 1858. "A Primitive Corner" An 1862 correspondant to the Inverness Advertiser provides background on conditions in Coigach. 1862 newspaper article on conditions in Lochbroom. 1863 correspondant to newspaper provides "interesting information from this secluded district." Roads, hand-milling, starvation, and other details. 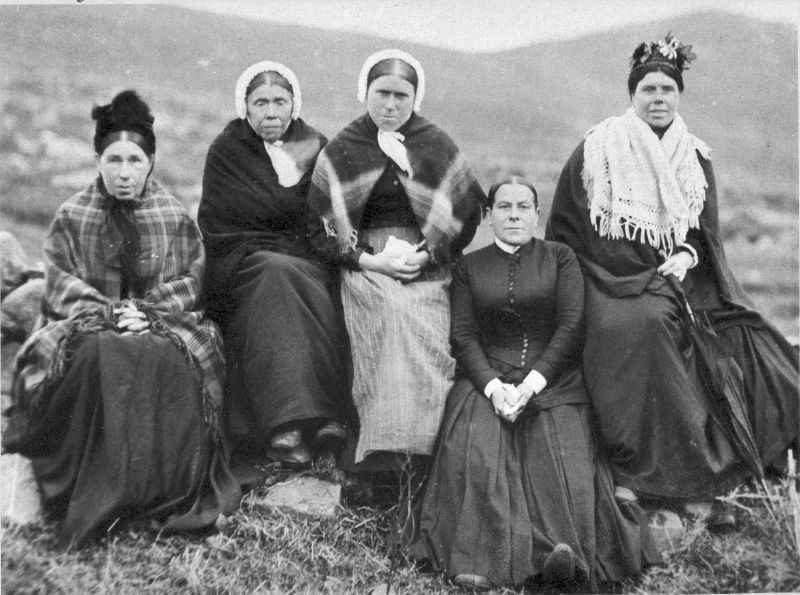 MacGregor sisters Two sisters from PerthShire married prominant MacKenzies at Coigach in the early 19th century. Was their grandfather related to the ancestors of the Coigach Stewarts? Matooskie, one of many interesting descendants of Coigach people. Her father from Achiltibuie became a prominant fur-trader in Canada, Nancy, "Matooskie" Mackenzie his daughter through a Chipewyan wife led an interesting life. Sir Alexander Mackenzie, famous for explorations in North America, was from Stornoway across the Minch on the Isle of Lewis, this file "explores" his cousin relationship to four fur trade brothers from Coigach. 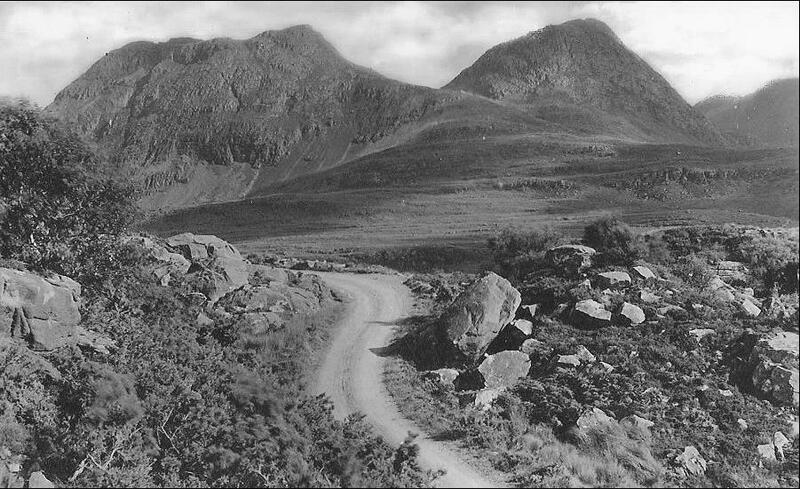 HIGHLAND DOCTORS HEROISM In 1910 Dr Gunn goes "the extra mile" for his patients, climbing across Ben Mor Coigach in the dark on a stormy night. Mary Marjorie Macdonald, a fish curer's daughter from Ullapool grew to become the most notorious jewel thief in Britain in the early twentieth century. 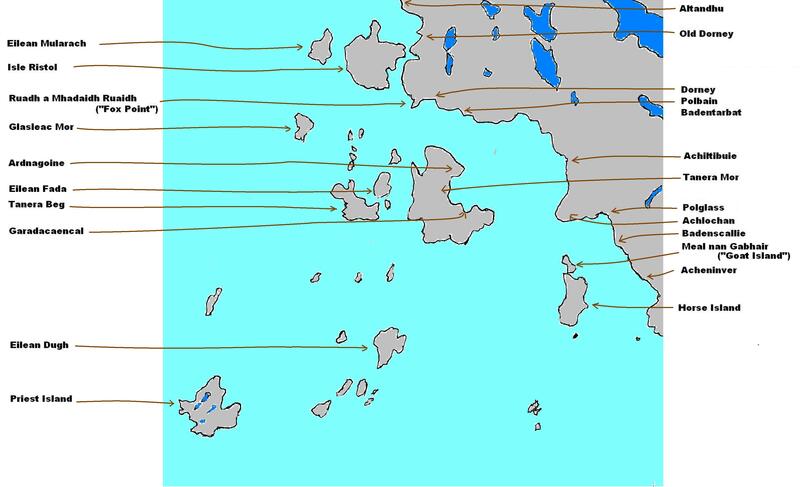 As well as the islands on this map are two others in Lochbroom that some sources consider to be part of the Summer Isles; Isle Martin off the coast of south-east Coigach, and Isle Gruinard off the western end of the Scoraig peninsula (the peninsula between Lochbroom and Little Lochbroom). 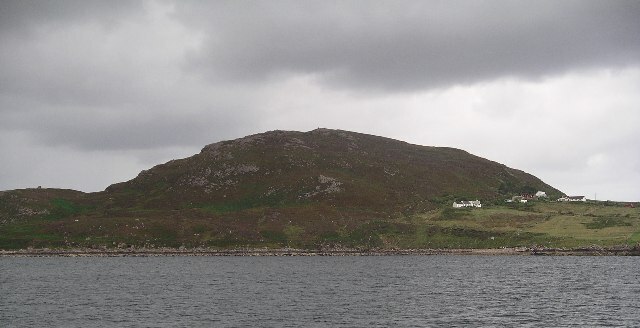 Of the islands above only Ristol and Tanera Mor had documented residents in the 19th century, though many of the others were used for grazing or were visited regularly to harvest "seaware" (seaweed) to fertilize crofter's fields, and Eilean a'Chleirach, "Priest Island", figures prominantly in history following the 1745 Rebellion, harbouring French Privateers and military cadets trying to rescue Bonny Prince Charlie. 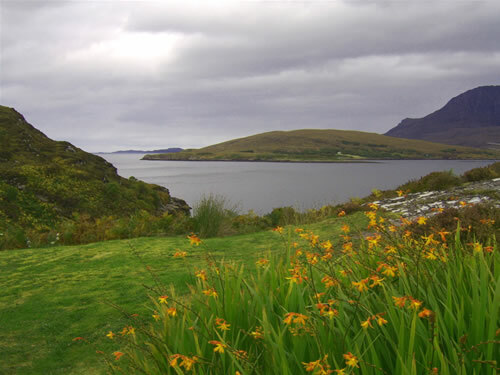 Traditionally the Summer Isles were considered part of the Hebrides, the name "Summer" coming from an old Norse word meaning "boundary". 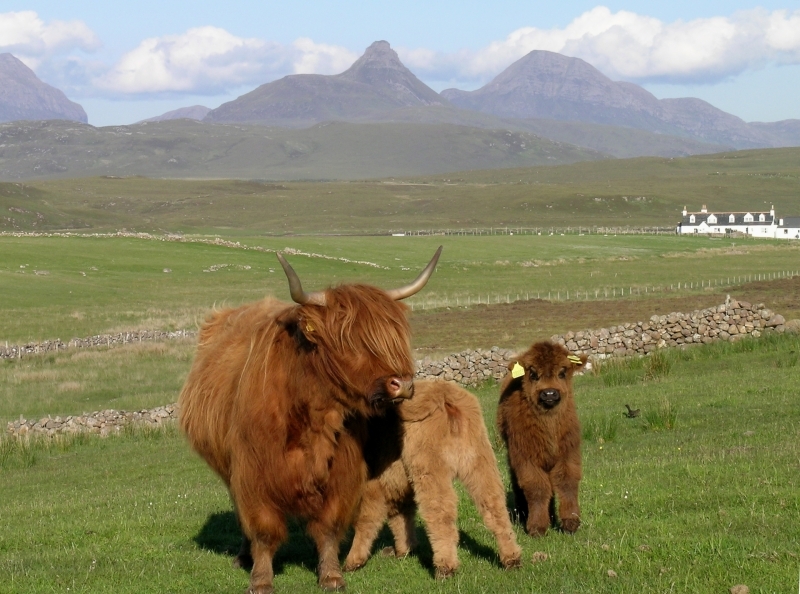 taking a break from their tweedmaking, familiar with the tales above, perhaps they have a few of their own to share! 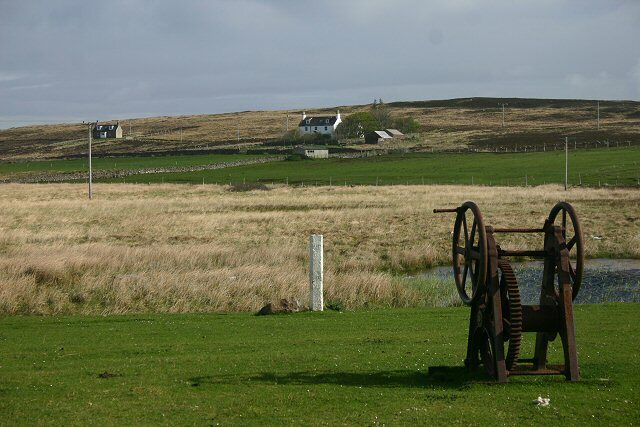 Tweed making in Coigach was very much a "cottage industry", though never competing with the black cattle economy that dominated to the early 19th century, or the crofting economy that developed then, the income from the small farms supplemented by herring fishing. From ancient times Coigach tweed was highly valued for its quality; the first rent roll for the farm of Achiltibuie following the 1745 Rebellion show the Tacksman, Roderick Mackenzie, paid his rent as a little over seventy-eight pounds cash, three wedders (two to three year old castrated sheep), four stones of butter (fifty-six pounds), and importantly included half a plaid of white tweed. National censuses of Scotland have occured every ten years since 1801 (except 1941 during WW2). The earliest three did not include individuals, though are useful for sociology of tracing occupations. Starting 1841 every individual was named. Before 1841 researchers must look for "census substitutes", such as rent rolls or petitions. 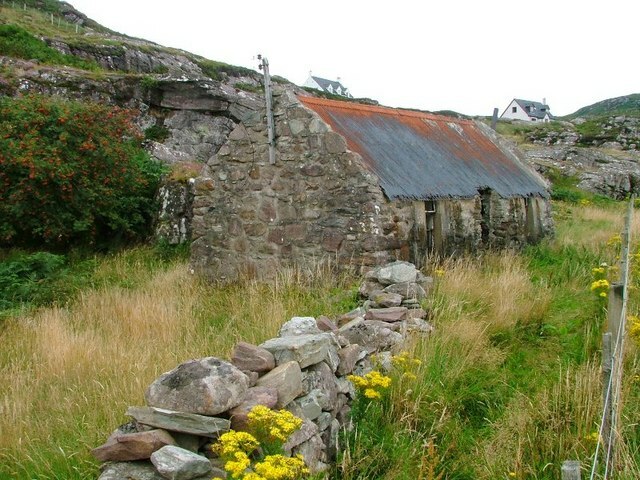 Coigach as part of the Parish of Lochbroom has six known surviving Militia Lists, the first, in 1797, notes men between the ages of 19 and 23, the rest men between 15 or 16 and 60, in the National Archives of Scotland is a brown paper bag with numbered lots, drawn each year to select individuals for serving in the Militia. Much data can be found in the Lists; occupations, places of residence, and occasionally relationship to others are noted, which with aid of christening and marriage records in the Parish Register can help track migration of familys within the Parish, and suggest lines of relationship when in-laws, cousins, nephews, or nieces are shown in later records. 1798 Militia List 558 males from ages 15 to 60, omits 140 members of "the Ullapool Volunteers". Also notes which communities and some of the individuals who held 89 boats, 366 horses, and 9 coups (wagons). Alexander MacLeod with his game bag and gun stands ready to help you hunt for ancestors through the 19th century census records of Coigach! 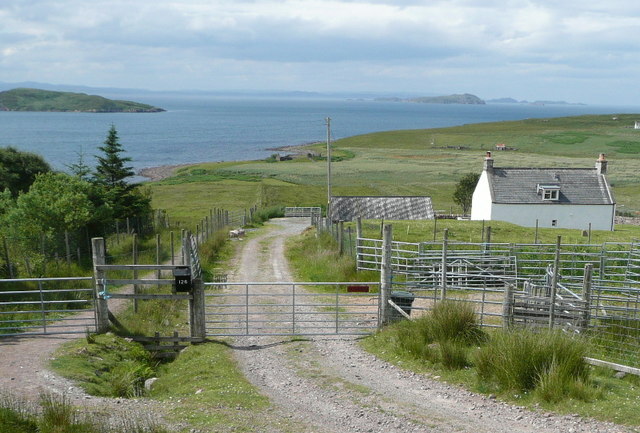 Alex lived his life in Coigach, and shows up in most of the 19th century censuses starting 1841 as a two year old at Culnacraig 41-3, through to 1881, though away from home in 1891 at Achnahaird 91-4. His gt-granddaughter, Kate Ferris, (CONTACT INFO), sent this photo and lots of details on the life he led. These files include transcripts of each decennial census from 1841 to 1891, enriched by notes from descendants such as Kate, information in histories, Parish and Civil Registration. Through hypertext links between Households and succeeding censuses you can track relationships. Far from a complete project, any assistance is appreciated! 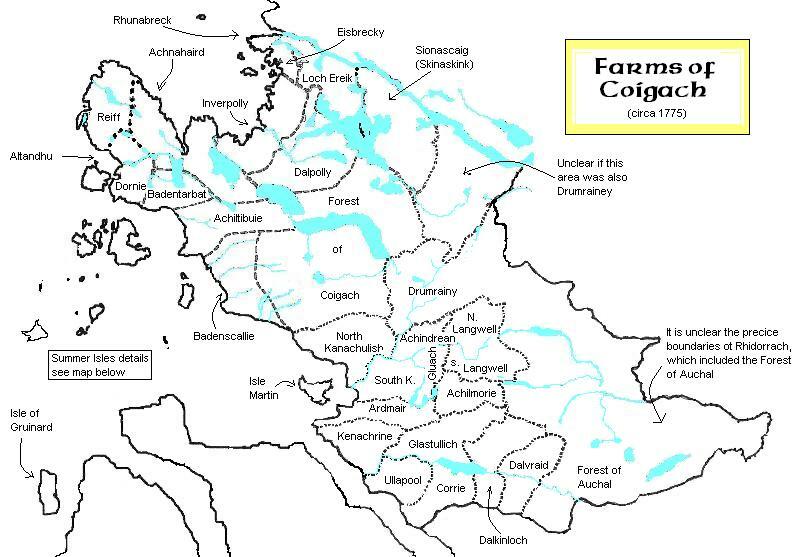 The following map is based on several mid 18th century maps of Coigach showing the farms then, click on areas of the map to go to the files with genealogy data on those places, many places in the 19th century and later records are not named on the map, a jump table follows with links to files on those places. 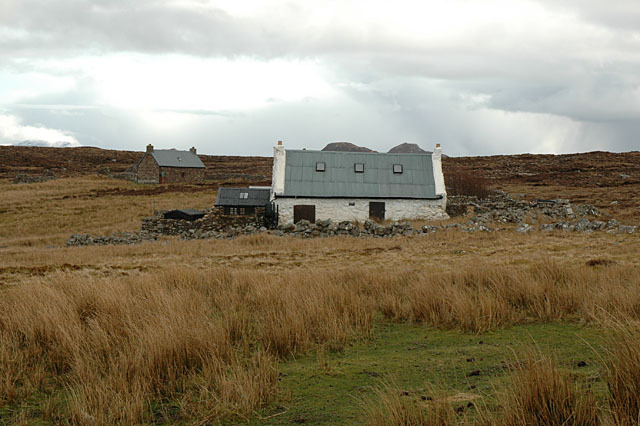 At the time of the map the farms of Coigach were let as "Tacks", the "Tacksman" or principle tenant holding the prime land, and subletting the lesser parts to from a handful to two dozen sub-tenants, whose rent and services such as tilling the Tacksman's fields often exceeded the Tacksman's rent to the landowner. 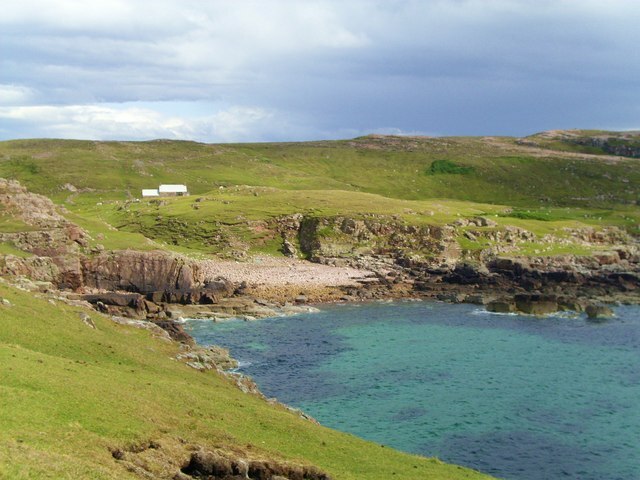 Reiff and Altandhu were originally part of the Tack of Achnahaird, the Tacksman there in the late 18th century removed most of the families from the Aird of Achnahaird to Altandhu, mainly MacLeans. 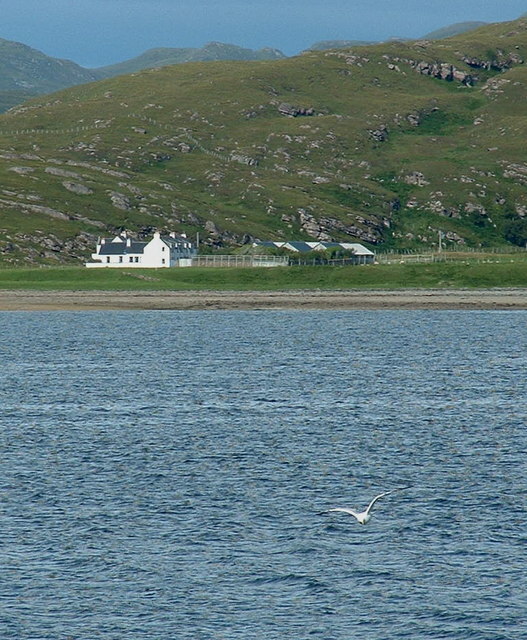 A communuty of a few households developed at Camuscoille near Achnahaird, tied in rent records to Altandhu across the peninsula. 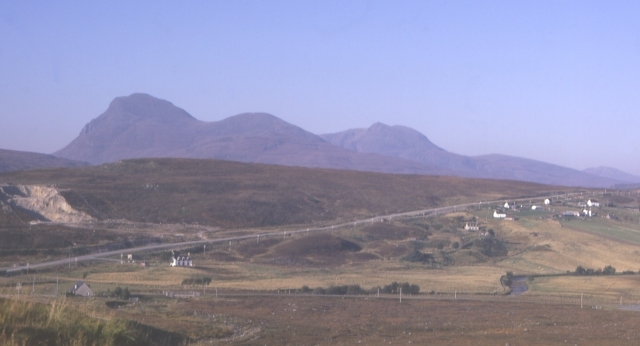 Sizable new communities broke out at Polbain on the east of Dornie, and Polglass between Achiltibuie and Badenscallie. Smaller communities of less than half a dozen families each broke out elsewhere along the coast. Placename spellings in the map follow modern form. The following communities are in the south-east area of Coigach. 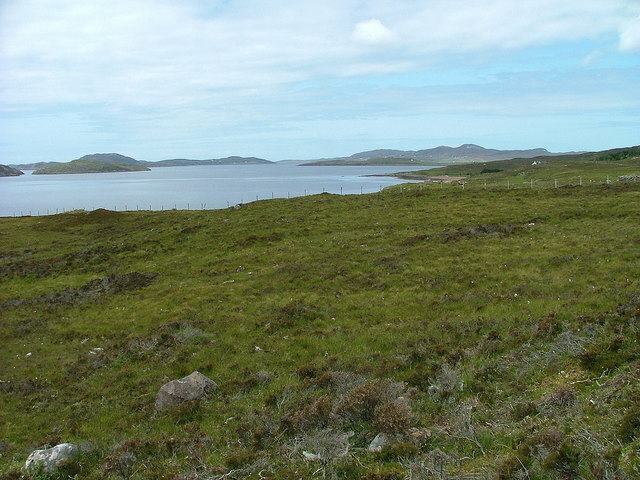 Historically this area was always part of the Barony of Coigach, though starting 1857 civil registration and censuses recorded them as part of the rest of the Parish of Lochbroom, separate from the places in that part of the peninsula "beyond the big rock", noted above, which remain noted as "Coigach". Though the files in this website concentrate on that other part, there was much intermarriage between the families, and so I am slowly adding more data here. is now archived, click HERE to view.